If it was not obvious by now that I love Band of Brothers and military history. It should be with this review. 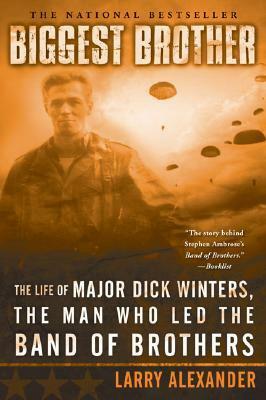 I consider Major Winters my hero and someone I look up to. This is one of three books written about him and I really loved it. This book had a lot of commentary about the different battles and how Winters knew what to do in battle. He wanted to make sure his men were not put in situations that did not put them at extra risk of being killed. The book shows how much he really cared for his men and their well being. It also shows how sad he was when some of his men were killed like Don Hoobler, Skip Muck, Alex Penkala. Robert Van Klinken. The readers can see his friendship with Lewis Nixon who was his total opposite but they worked well. The part about how the book got written was wonder especially since it talked about which veterans were contributors. Veterans like Carwood Lipton, Don Malarkey, Forrest Guth, Smokey Gordon, Joe Toye, Bill Guarnere, Harry Welsh and others helped make the Band of Brothers book a reality. The last few chapters talked about the men he had lost to age and health was touching and sad. It showed how Winters still cared about everyone under his command long after the war ended. The book was well written and I am happy to have read this book.